The evidence is mounting that our solar system is rife with oceans. Last week, scientists reported that Pluto could have an insanely deep liquid water swimming pool beneath its surface, and on Monday, NASA revealed new evidence for geyser activity on icy Europa. 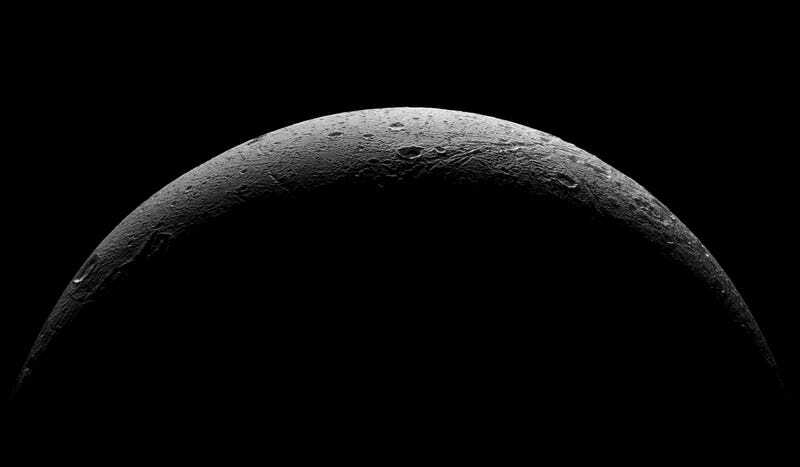 Now, another frozen moon is poised to join the club of outer space scuba retreats: Dione. The fourth largest moon of Saturn, Dione was first imaged by the Voyager space probes in the 1980s, and has been viewed more recently by the Cassini spacecraft, during a series of five close flybys. It’s a beautiful, cratered ball of ice and rock, home to deep canyons and towering cliffs. While early flybys offered hints of geologic activity, there’s never been a smoking gun to prove Dione is alive inside—particularly when compared with its next-door neighbor (and orbital resonance partner) Enceladus, which is spewing seawater out of enormous geysers. But a new study, which has been accepted for publication in Geophysical Research Letters, suggests we may have underestimated Dione. The moon could have a liquid water ocean beneath its surface, just like Enceladus. Using a geophysical model that depicts a crust ‘floating’ atop a mantle, Mikael Beuthe of the Royal Observatory of Belgium shows that gravity data collected by Cassini can be explained by a ~100 kilometer (62 mile)-thick shell of ice enveloping a 65 kilometer (40 mile)-deep ocean. 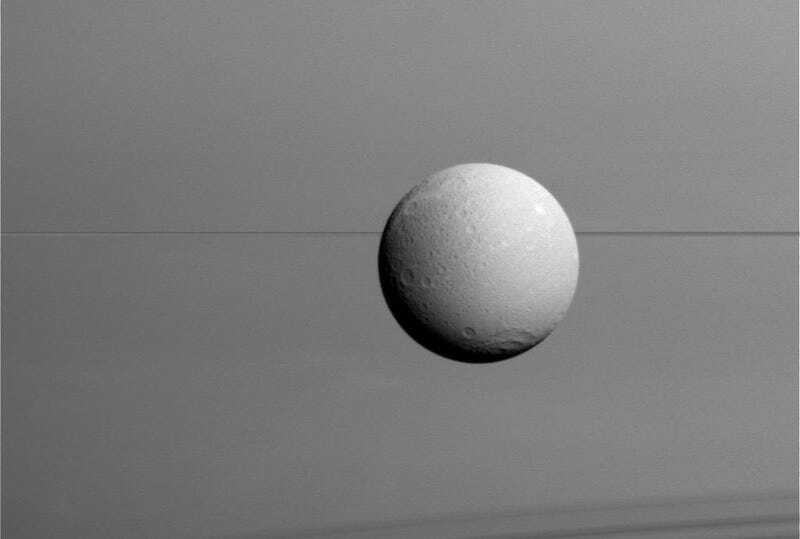 Dione’s ocean, in turn, would smother a rocky core. The first evidence for a subsurface ocean on Enceladus also came from gravity anomalies detected by Cassini, in a series of flybys between 2010 and 2012. As the spacecraft zipped past the moon, its velocity was slightly altered due to variations in Enceladus’ gravitational field. That change in velocity was measured from Earth via the Doppler effect—a shift in the radio frequency of Cassini’s transmissions. In 2014, researchers at the Jet Propulsion Laboratory concluded that Cassini’s radio transmissions were hinting at a south polar sea beneath Enceladus’ icy shell. But a year later, independent measurements of Enceladus’ “libration”—a slight wobble as it orbits Saturn—revealed that the ocean is probably global. 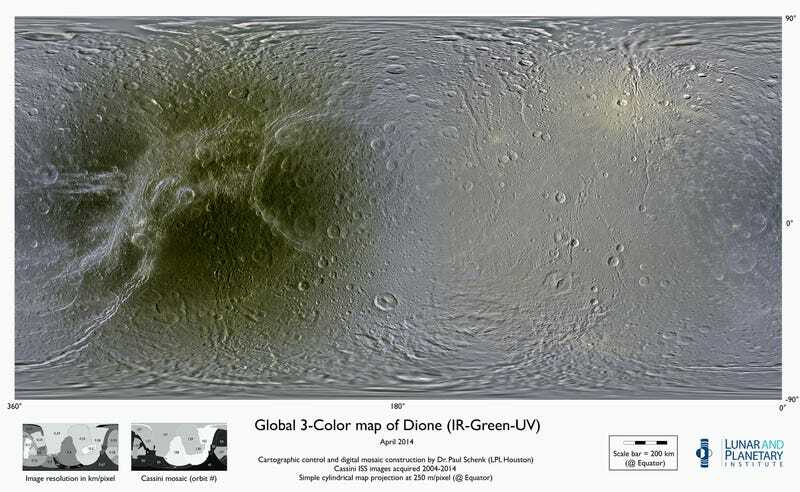 According to Beuthe, we won’t be able to confirm Dione’s ocean with libration measurements the way we did for Enceladus, both because Dione is more spherical and because its crust is thicker. But there are other reasons to suspect this moon’s ocean is the real deal. For one, gravity data also tells us Dione has a rocky core, spanning approximately 70 percent of its total radius. As radioactive elements decay within the core, they produce heat, melting the overlying ice. This almost certainly caused a subsurface ocean to form in Dione’s early history—which, by the way, might not have been too long ago. Icy cliffs and smooth terrains also hint at recent geologic activity, which again, is difficult to explain if Dione is simply a ball of ice frozen to rock. 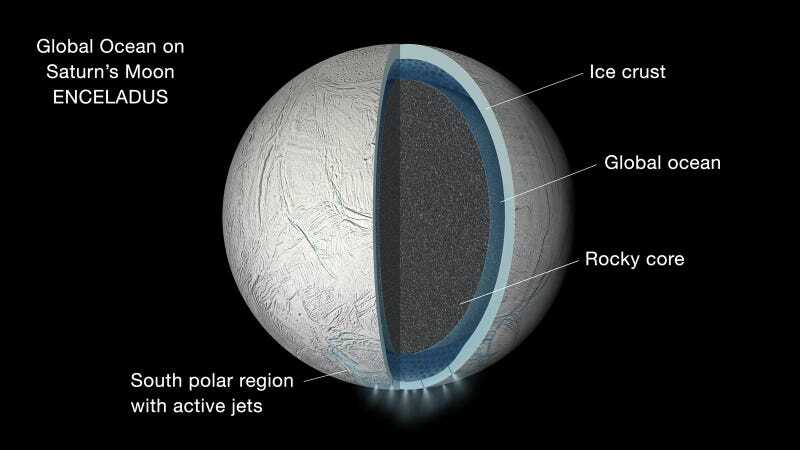 Detection of geysers, similar to those seen on Enceladus and Europa, would really seal the deal for an ocean on Dione. But we haven’t seen geysers yet, and given the estimated thickness of Dione’s crust, Beuthe isn’t so sure we will. If Beuthe’s hunch about Dione is correct, the astrobiology implications are thrilling. It’s likely the ocean would have been around for the moon’s entire existence, long enough for microbial life to emerge under the right conditions. Another mind boggling thought: perhaps Dione and Enceladus have been exchanging alien microbes for hundreds of millions of years. If one thing is becoming clear, it’s that oceans are not so unusual or special in our cosmic backyard. Does that mean life isn’t, either? We’ll need to keep exploring to find out. Scientists have long suspected that Enceladus, one of Saturn’s tiny moons, might be harboring a subsurface ocean. But new data from NASA’s Cassini spacecraft paints a more interesting picture: an ocean is covering the entire thing. Researchers noticed a slight wobble in Enceladus’s orbit around Saturn, and there’s only one real explanation: the icy crust on the surface and the rocky core within aren’t frozen together. In other words, there must be a body of liquid separating the core and the crust; specifically, a giant undersea ocean. To calculate the wobble in orbit, researchers examined seven years of images, mapping the positions of features like craters, and using that to build up a picture of the moon’s orbit. “If the surface and core were rigidly connected, the core would provide so much dead weight the wobble would be far smaller than we observe it to be,” according to Matthew Tiscareno, a Cassini participating scientist at the SETI Institute. The discovery of an undersea ocean is obviously a big deal — Enceladus’s core contains silicates, things like phosphorus and sulphur that are vital for life. Combine that with a liquid ocean, and it’s an excellent place to look for living things.